This blog will no longer be active. Thanks to all that have come and read my posts here over the years . Rise Up from Whaea Productions on Vimeo. THE NATIONAL CENTRE FOR FIRST NATIONS GOVERNANCE along with our partner and host, Squamish Nation, are bringing together young emerging leaders from First Nations communities across Canada. Participants will be introduced to tools for engaging communities in culture, language and inherent rights. This is a unique opportunity for future leaders to meet others and join a growing network of young emerging leaders who wil lead the revolution for positive change in our communities. ENTERTAINMENT: Bring your regalia for Saturday evening’s Culture in Action Squamish Nation Feast and on Sunday, after our amazing workshops, enjoy some free time in the international ski resort of Whistler BC, located in the shared territory of the Squamish and Lil’wat Nations. Satsan, a Wet’suwet’en Hereditary Chief, educator and expert in Aboriginal rights and title, has long recognized that it is critical for today’s First Nation leaders to fully prepare our young people for the hard work of restoring our nations. Leadership is a fully participatory process that depends on the dynamic interplay of relationships in the community. Hosting stresses the elements of hospitality, respect, and generosity so that all people of varied backgrounds and beliefs to come together in a good way. The Art of Hosting provides processes where conversations that matter happen. Chris is an accomplished facilitator who has worked with a long list of Aboriginal organizations in Canada and abroad. What does it mean to exercise our inherent rights to our language, culture, ceremonies, spirituality, family and living off the land and water? This question is addressed in a passionate presentation by Laura and Rachel. William Wasden Jr. (Wax̱iwidi) is leading a workshop on the art of traditional songs and singing. He is a respected singer, cultural leader, and song composer amongst his peoples. Bringing his vast knowledge and teachings he will share his knowledge to the next generation of singers in the cultural revitalization of all our nations. His goal is teach the next generation to share authentic culture in a respectful and dignified way. Revitalize Your Nation’s Language: Where are Your Keys? If a something isn’t growing, is it dead? If a language is producing no new fluent speakers, is the language alive? Khelsilem Rivers of the Squamish Nation and April Charlo of the Flathead Reservation in Montana will lead a intensive training on addictive techniques that train you to know how to become a fluent language speaker. They will be teaching the concepts of the “Where are your keys (WAYK)?” system where participants become players and hunters of their language. You will learn how to lead the way in language acquisition and language revitalization. Register a group of four or more and save 20%. Under 19 must attend with an adult chaperone. Emory Douglas, Minister of Culture for the Black Panther Party, meets Zapatista Mayan Artist in Zapatista territory to create some ART. A multimedia exploration of the artistic and political connections between the Black Panther Party and the Zapatista movements as incubated in San Cristóbal de las Casas, Chiapas, Mexico. To coincide with Emory Douglas', the former Minister of Culture for the Black Panther Party, residency in its space, EDELO (En Donde Era La ONU), a creative laboratory, will develop an art exhibition and single-issue newsletter. The exhibition will showcase pieces by local Zapatista artists and will explore their artistic identification with the Zapatista and Black Panther movements; the newsletter will pay homage to Douglas' work in the Black Panthers' popular press and will showcase new articles and artworks that will explore the connections between art and social movements as manifested in today's multifaceted world. In 1994, the Zapatista uprising, a Mexican, indigenous movement originating in the southern state of Chiapas, generated and disseminated a different sort of mass communication made possible by the rise of the internet. Photographic, video, and written information regarding the movement’s actions spread around the world in real time, increasing awareness of the Zapatista cause while also building solidarity for what the New York Times termed “the first post-modern revolution.” Positioning itself as a struggle against neoliberalism waged against 500 years of oppression, Zapatismo has employed new technologies of information distribution in order to articulate their wants, beliefs, and various identities to themselves and to their global audience. The Black Panther and the Zapatista movements occurred in distinct cultural, political, and historical milieus; nonetheless, the two share a common appreciation of the power of the image and the written word to build their respective social movements into personal, collective, transformative, and public experiences. In contrast to the strong self-definition established and disseminated by these two movements via pertinent media channels, today’s multimedia, plugged-in landscape seems to promote the opposite development. Today we tweet, text, and browse through myriad contexts, occasionally gaining a glimpse into the exterior world but more frequently losing ourselves in the internet’s echo chamber of opinions and perspectives. ZAPANTERA NEGRA (ZPN) will be a single-run magazine of 20,000 full-color copies that will merge the powerful imagery and layout style of Emory Douglas with the visions and voices of Zapatista painters and embroidery collectives. It will bring the two similar movements together on the page to demonstrate their commonalities, tie the movements to the present, and articulate a new, collaborative, interdisciplinary mode of information distribution and political, social, and economic self-identification. Emory Douglas, the former Minister of Culture for the Black Panther Party, will be in residency at EDELO in Chiapas, Mexico in November of 2012. During his time in Chiapas, he will visit Zapatista communities and work with Zapatista painters while simultaneously guiding a team of artists and editors in the layout and construction of ZPN. The newsletter will also include personal reflections authored by writers, academics, and artists on how art has moved and encouraged their own self-definition, work, and hope in a possible, better world. ZAPANTERA NEGRA will be distributed in five countries and within select educational, artistic, and political institutions. Its project coordinators hope to develop a grassroots distribution network that will also allow for its dissemination to communities with little access to alternative media. The newsletter will also have a social media platform where “friends,” “followers,” and “fans” will be able to download, print, and wheatpaste the newsletter on overpasses and walkways. The newsletter production and distribution will be paralleled by the production of a collection of tapestries made by Zapatista embroidering communities that merge and exchange Black Panther imagery as articulated by Emory Douglas with that of the Zapatista movement. Emory Douglas – Lead Artist – San Francisco, CA RIGO 23 - Artistic direction – San Francisco, CA Caleb Duarte – Project Coordinator - Chiapas MX Grace Remington – Editor – Lima Peru Francisco Duarte – Translation – Nogales Mexico Mia Eve Rollow – EDELO Residency Coordinator - Chiapas MX Jose Luis – Exhibition coordination and Zapatista Painter Chiapas MX Antonio Vazquez– Painter from the community of Chenalho Chiapas MX. Lorena Rodriquez Zapatista woman’s embroidery collective project Chiapas MX. Carla Astorga – Distribution South America – Santiago de Chile Anne Brigitte Kouakou – Distribution – Oakland CA Kency Cornejo – Distribution – Los Angeles CA Kenya Moses – Social Media – San Francisco CA Design and printing - Victor Vayajel, SCLC Chiapas MX. WHAT WE NEED YOUR HELP ON! Since this work will be distributed for free in various cities, and the team in general is volunteering their talents, with the exception of small symbolic stipends that will be given to those working with translation, the woman's embroidery collectives, editors and administrative work; we are depending on the enthusiasm of artist collectives and a real collaborative effort between the team at large. This creates challenges in organizing for the success of all three parts of this project. 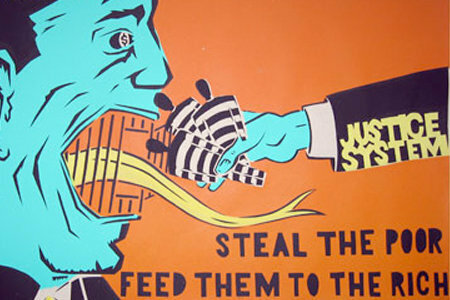 Emory Douglas Residency - Art exhibition - and the News Letter. For that we have put together a wonderful team with extended experience in running a succesfull Residency program with all artist involved, Curating a complex exhibition celebrating political art with the use of performance, installation, and video. We are also working with local editors and publishers from a local independent news paper Mirada Sur in Chiapas MX to guide us with the lagistics of working with the printed medium. February: Simultaneous distribution of newsletter in various, alternative art spaces in Honduras, Chile, Mexico, the US, and Spain. Nā Maisey Rika i whakapākehātia. Tangaroa commander of the tides. Celebrating the Life of Geronimo ji Jaga from proj-ect PRO:JECT on Vimeo. Tuiloma Lina Samu who resides in Aoteara gives her reflections & observations about Rio+20, she was attending with the Asia Indigenous Peoples Pact (AIPP) as an Indigenous women's rep for Samoa. Malo lava le lagi e mama ma le soifua maua! This morning as I prepare to go to the "main" conference of Rio +20 at the Rio Centro, I have reflected upon the meetings that I have attended for the past two days with indigenous people from all over the world. I am honoured to have heard the stories, the histories and the ongoing battle that many have with concerns over discrimination, disadvantage and even threat of death and killing. I was able to share with others about our concerns in the Pasifika: of Tagaloa/ Tangaroa consuming our islands; that fresh water supply is dwindling in some areas because of the rising seas destroying groundwater tables; that we are like many other regions a dumping ground for the chemicals and toxins that the first world makes illegal in its own homes; that the Pacific Ocean is home to a plastic formation the size of France. It seems so unfair that the smallest polluters are paying the highest price! The biggest emphasis from the Indigenous Peoples' fonotaga at the Museu da Republica is that culture - that is languages our identities and our traditional/ ancestral knowledge is a fundamental dimension of sustainable development. Sustainable development will only happen if there are sustainable relationships between us as human beings - so we have to talk to each other as aiga/ kainga/ famili/ whanau about how we're going to do our part to take care of the natural resources we've been blessed with. This is what our Samoan ancestors called "o le va fealofani" and what Maori call "whakawhanaungatanga". It is our relationships of caring and co-operation that is key to finding solutions. Even though these problems have been caused by industrial manufacturing and production - we have responsibilities and obligations ourselves as indigenous peoples. Look at how our ancestors for millennia, our parents and grandparents and great grandparents lived within their means and only taking what they need. In the Pasefika, we don't face continuous threats of war and genocide as many other people do, yet we have to be vigilant to ensure that we are not bullied by our governments and by transnational companies advancing the "economic growth" agenda. "Fool me once: The regional lessons from the impacts of Tonga's WTO accession" is a look through the eyes of Tongans what membership to the World Trade Organization has meant for them and their country. Tonga became a member of the WTO in 2005 under what has been described as "arguably the worst terms ever offered to any country" - requiring the Pacific Island nation to make wide ranging and binding commitments on trade liberalisation. Speaking about the impacts as felt through a cross-section of society, this video documents how the promised benefits of WTO membership have failed to not only materialise but have increased hardship across the country. The film ends with a plea to other Pacific countries considering joining the WTO to learn from their mistake and not be fooled by the promises that accompany membership. This week the 'Urewera 4' - Emily, Urs, Rangi and Taame - will be sentenced in the Auckland High Court. This is happening on Thursday, May 24 at 9am. The court is open to the public and we encourage people to come to support them. The pre-sentence report (required by the court) has recommended community service, but the crown is pushing for jail time. The decision is up to the judge. The maximum term for Arms Act charges is 4 years or a $5000 fine. If this wasn't a racist police operation, then we would actually see those responsible for serious criminal offending being punished. By this, of course, we mean the police involved who were found to have committed wilful trespass onto Tuhoe hand and breached human rights in the process. We are working to have these Arms Act convictions thrown out by having the decision of the Supreme Court applied to the remaining four defendants. This is only one step to a just outcome for the horror wrought by Operation 8. 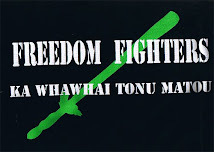 We also want the Terrorism Suppression Act repealed, the victims of the raids compensated, Te Urewera returned to Tuhoe and tino rangatiratanga for all iwi and hapu. Starting this week, a nation-wide hikoi is leaving the far north and traveling to Wellington carrying a raft of messages to the government. These include opposition to state asset sales, opposition to the Trans-Pacific Partnership Agreement (TPPA) and opposition to expansion of resource extraction (e.g. off-shore oil drilling, fracking, gold and coal mining). There is considerable appropriateness in bundling these issues together, and the opponents of these issues see them as interrelated. Briefly put, the linkage stems from a view that the country is being sold-out to multinational corporations with little or no benefit accruing to the people, and with negative social, political, economic and environmental consequences. It is hard to overstate the validity of these concerns. However, absent most of the discourse about these issues is what lies at the heart of all of them: capitalism, in particular neo-liberal capitalism. The failure to direct our analysis to the root cause of these myriad social, economic and environmental issues will allow a further strengthening and entrenching of it. Neo-liberal capitalism – or neo-liberalism in shorthand – is characterised by the privatisation of public assets; deregulation of trade, finance, investment, education and healthcare by nation-states in favour of trade management through a global rules-based system; the growth of multinational financial institutions (such as the IMF and World Bank); the rise of foreign direct investment; the development of intellectual property as a commodity, and a focus on individualism and societal atomisation. Indeed, neo-liberalism has been called ‘capitalism with the gloves off’ because business forces are stronger and more aggressive, and they face less organised opposition than ever before. This description fits well with the general thrust of the National Government’s political agenda. In reality, however, it is not so different from that of the previous (and potentially next) Labour government. This is why a debate about the more fundamental organization of our economic, political and social systems must be had. This is why we need to talk about capitalism. New Zealand has already been subject to the extremes of neo-liberal capitalism under the fourth Labour Government and its successor in the 1990s National Government. Under Helen Clark, some of the worst excesses of the neo-liberal capitalist polices were abandoned (like private prisons and charter schools), but in other ways, neo-liberalism became even more deeply embedded into the political, economic and social fabric of New Zealand life. One of the best examples is the vigour with which the Clark government negotiated free-trade agreements and significantly relaxed Overseas Investment Commission oversight of foreign land and asset buying. New Zealand society and social life has been transformed in the past 30 years. In particular there is a discernable shift from collective responsibility for social issues to individual responsibility. Health care and higher education, once viewed as a right and a collective good respectively, are now sold to us as an individual benefit, the cost of which must be borne individually. As a two-time Victoria University student, I was aghast at the ease with which the University Council raised student fees again and again against significant student protest when they had themselves been the beneficiaries of completely free university degrees. Part of the uproar about the National government’s approach is simply the brazenness with which it is being carried out. Key makes no apologies to those who don’t embrace his worldview: exacerbating the gap between rich and poor by making the rich richer, blaming the poor for being poor and if possible criminalising them at the same time. Yet, what is critical for us to understand is that while Key’s approach is utterly odious to those of us who seek a more just world, it is simply part and parcel of capitalism. A government, any government, which operates a capitalist economic system operates a system of unavoidable injustice. That is the very nature of capitalism: it is the theft of the labour of the working class and the transfer of that wealth to the owning class. The dominant feature of neo-liberal capitalism in the past 40 years is the growth in power of multinational corporations. Again, it is difficult to overstate the power exerted by corporations on the political and economic choices made by nation-states. It is now reported that more than half of the 100 largest economies in the world are corporations. Corporations such as Exxon, Chevron, General Electric, and Walmart have revenues that far outstrip New Zealand’s entire gross domestic product. While these corporate names may strike you as decidedly American, a number of very well known ‘kiwi’ brands equally well meet the definition of a multinational corporation (i.e. they are a corporation with 25% or more foreign ownership). Included among these are the Bank of New Zealand, Skycity Entertainment Group, Contact Energy and Telecom. The long and short of it is that the location of ownership is irrelevant; there is no such thing as ‘Chinese capital’ or ‘New Zealand capital’; there is money. The overriding impetus of corporations is to maximise profits. Local corporations exploit the environment and workers just like multinational ones do. The fight shouldn’t be about domestic or foreign ownership; the fight should be about ownership full stop. This is why a fundamental alteration to capitalist economics is so necessary. In order for us to consider what other ways we can be in the world we must recognise first and foremost that the system is rigged. It is a system reliant on exploitation and inequality. If we don’t want those things then we are going to have to try something else. The first step is to re-introduce the critical discourse about capitalism to the forefront of our struggles; only then we will be able to more clearly see where power lies, and what avenues are available for change. 1. Robert W McChesney. 1999. ‘Noam Chomsky and the Struggle Against Neoliberalism.’ Monthly Review. 1 April. In Solidarity with the Aotearoa is Not for Sale Hikoi I'm posting a presentation I did Melbourne Round presentation at the TPP stakeholders meeting held in Melbourne in March this year. Hei tautoko i te iwi Moemoea no Ahiterairia. Kaati noa ra, ko tenei te wa ki te tu rangatira, tu kotahi i te kawau maro, o tenei kaupapa"
Indigenous peoples in the pacific have found the great ocean of Kiwa, a spiritual & cultural home for thousands upon thousands of years. We lived in harmony with our environment and each other; we were self-sufficient and had 100% of our lands, & 100% of our Culture, custom & language. White supremacist, Capitalist Imperialism & genocide shattered that world for many Indigenous peoples in the Pacific last century. As we meet here today, on the stolen lands of the Kulin Nations we are aware that occupied Australia is the land of genocide and apartheid for its Indigenous peoples. The invasion of Aboriginal lands was illegal under international law at the time of the arrival of the First Fleet. This invasion involved the perpetration of war crimes, crimes against humanity, genocide and theft of Aboriginal homelands. The current contempt and lack of respect, rights, Treaty and third world conditions that Indigenous peoples face in Australia is an International Shame. Like New Zealand Canada, and the USA, Australia is a colonial settler state, based on invasion, dispossession and colonisation. Its past 30 years of free market fundamentalism must be understood in the context of an ongoing colonial occupation of Aboriginal lands and resources on which the Australian nation-state is based. As we faced last century, today Indigenous peoples of the Pacific are facing the onslaught of globalisation, trans national corporations and the neo colonialism of the TPPA. The TPPA is a direct denial of the rights of Maori as stated in the 1835 Declaration of Independence and as reaffirmed in the Treaty of Waitangi [and] the Declaration of the RIghts of Indigenous peoples. It is also a continuation of the 'New' Right policies of individuated colonisation. For indigenous peoples struggling for liberation this means there are two waves of colonisation to fight. The first wave of colonisation has left the indigenous amongst the most disenfranchised, disempowered and dispossessed groups on the planet. This is well documented. The object of deliberate genocide, tens of thousands, hundreds of thousands of indigenous people have died during our time in the struggle to retain the right to live on and care for their territories to which they not only depend for survival but also have ancient, deeply-held spiritual and genealogical connections. The governments of Australia, New Zealand and the United States worry that recognition of collective Indigenous rights could impinge on corporate exploitation of Indigenous resources. Interestingly, these are precisely the three nation-states where intentional genocidal policies were pursued, policies that sought to exterminate all the indigenous peoples living in the lands seized by settlers from the British Isles. The populations of those states should be ashamed, not only of their horrific pasts, but also of the present refusal of their representative governments to make amends with the descendants of those indigenous peoples who survived these genocidal policies. It is within this context that the neo colonialism of the TPPA is seen by Indigenous Peoples. As wahine Maori, (Maori Women) our long and deeply-held traditional values and understandings of collectivity, of manaakitanga, of kaitiakitanga (Caring for Earth Mother), for Tangaroa (god of the sea) and for their children, is in direct opposition to what is being proposed in the TPPA The TPPA represents a significant and disruptive challenge to Maori. The Trans-Pacific Partnership Agreement (TPPA) is for the overwhelming majority of Maori is just more neoliberal economic restructuring. Maori and Pacific Island communities have already borne the brunt of such policies from the 1980’s and 1990’s.The TPPA will intensify and increase these negative economic impacts in our communities. Such programmes around the world have successfully extinguished Indigenous rights to lands and resources. The selling off of our mokopuna and their future must stop. Little or no information on the TPPA is available in Latin America. Indigenous peoples of the region, who have strongly opposed free trade agreements with the US and other leading economies that were signed by several states in the region in the last few years, are even less informed of its existence. Their opposition is rooted in experience. The governments of these states have subscribed to those free trade agreements (FTAs) without consultation with the representative organisations of indigenous peoples, and even less with their free, prior and informed consent, in open violation of domestic and international law. Moreover, FTAs have triggered investment in natural resource extraction in their lands and territories, with devastating implications for many of their communities. Protest against such investments has been repressed and criminalised. The events that occurred in Bagua in the Peruvian Amazon in 2009, when thirty-four people died, exemplifies this repression. In the clashes, indigenous communities mobilised against legislation that was enacted to make possible the implementation of the US–Peru Trade Promotion Agreement. We reject the Free Trade Agreements with United States, Europe, Canada, China and other countries which have destroyed our economies, as new instruments of subjugation of our Peoples and plunder of Mother Earth. We reject the tactics of the European Union along with the dictators of Peru and Colombia that would destroy the Andean Community in order to impose their Free Trade Agreement. Clearly, many nation-states regard indigenous rights as a lesser right to the interests of corporations or the military – this tendency is an example of a recurring problem that indigenous peoples face, which is the reluctance and often-outright refusal for states to recognise indigenous land and sovereignty claims. We need to make the connections between the violence of colonialism and a culture of militarism & corporations that allows for the militarization colonial outposts. In the south Pacific that global pattern is repeated. The dominant wealthy nations are seeking to re-colonise what they see as their “patch”. Australia and New Zealand have been colluding to turn the Pacific into their captive market for low value goods, a source of cheap and disposable labour and plentiful natural resources. In the same vein, the TPPA will have huge impacts on indigenous peoples’ cultures, which are being threatened by the expansion of global culture into their communities and by the modification of their ancestral habitats with which their cultures are intertwined. They are also being impacted by the usurpation of their traditional knowledge, without consultation or compensation. In Geneva on the 21st of last month the International Indigenous forum at the world Intellectual property organisation released the following stated that the IGC, in its overall procedures, has systematically ignored our rights, as Indigenous Peoples and as Nations with internationally recognised collective rights, to self-determination and full and equitable participation at all levels. And that Indigenous Peoples, are the titleholders, proprietors and ancestral owners of traditional knowledge that is inalienable, nonforfeitable and inherent to the genetic resources that we have conserved and utilized in a sustainable manner within our territories. For this reason, we appeal to the States to acknowledge that the discussion on intellectual property rights and genetic resources should include Indigenous Peoples on equal terms with the States since the work will directly impact our lives, our lands, our territories and resources, and will reach to the very heart of our cultures, which are the inheritance of future generations. The Indigenous peoples present at this forum then decided unanimously to withdraw their active participation from a forum that has systematically ignored Indigenous rights. I don't expect the TPPA to be any different in that regard. A Pacific alternative to the negative effects of the TPPA is founded on indigenous values as opposed to economic globalisation, which is erected on the value of material goods. We want to live lives of dignity that are sustainable, peaceful and all embracing, where as TPPA globalisation is unsustainable, damaging, conflict-ridden, and excluding. These concepts are not merely a dream. It is founded in reality and has been our normal life all through out the Pacific. The institutions and values embedded in our culture & custom may not create wealth on a massive scale but they will never be responsible for creating second class citizens, destroying the environment at will, causing poverty, the debasement of humanity and denial of human dignity, as economic globalisation is doing. Against all the odds, and the threats we face to our lands, our cultures, and our ways of life in the Pacific, we have survived and we continue to resist. Evolutionary processes have taken their course in the pacific and the time has come for us to reach out across the vast ocean that binds us to support each other’s struggles and start to organise to halt the annihilation that we as a peoples are facing. The struggle for the power to freely exercise the right of self-determination now takes on a new dimension–indigenous peoples themselves will now come to believe we not only have the right, but we have the duty to freely choose our own social, economic, political and cultural future. The Pacific will face increasingly determined peoples seeking to be free of Colonialism and its twin, Capitalism. The struggle begins! . With an Indigenous orientation and practice we can potentially contribute to a world that will overthrow the economy of control and the class who benefits from it. Those who seek dignity and freedom in the Pacific should settle for nothing less. Aotearoa is Not for Sale !!! !